The word gethsemane is derived from two Hebrew words: gat, which means "a place for pressing oil (or wine)" and shemanim, which means "oils." During Jesus' time, heavy stone slabs were lowered onto olives that had already been crushed in an olive crusher. Gradually, the slabs weight squeezed the olive oil out of the pulp, and the oil ran into a pit. There the oil was collected in clay jars. The image of the Gethsemane on the slope of the Mount of Olives where Jesus went the night before his crucifixion provides a vivid picture of Jesus' suffering. 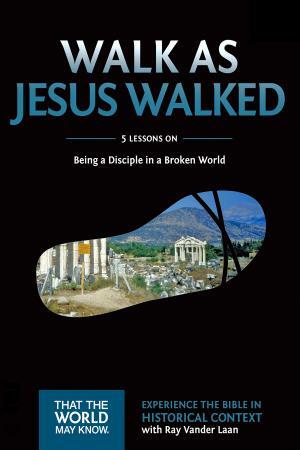 The weight of the sins of the world pressed down upon him like a heavy slab of rock pressed down on olives in their baskets. His sweat, "like drops of blood falling from to the ground" (Luke 22:44), flowed from him like olive oil as it was squeezed out and flowed into the pit of an olive press. 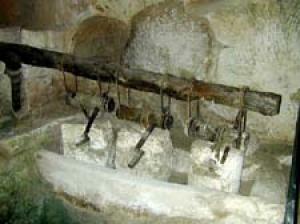 The olive crusher was the stone basin used to crush olives into pulp. A donkey pushed on a horizontal beam, which in turn rolled a millstone that crushed ripe olives (placed in a large, round basin) into a pulp.An olive crusher was often placed in a cave, where the moderate temperature improved the efficiency of the oil production.